This page is written for people who would like to travel to or from western Massachusetts on the Vermonter. 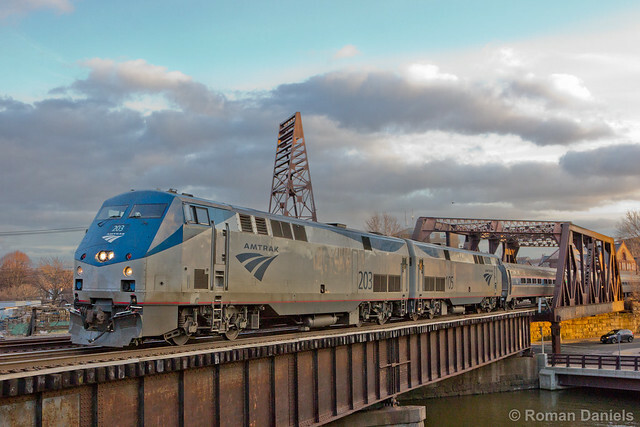 For more general information please visit Amtrak’s Vermonter web page. The Vermonter operates daily between Washington, D.C., and St. Albans, Vt., with service to Philadelphia, New York City, Hartford, Conn., White River Junction, Vt., and other intermediate stops. In the Pioneer Valley the Vermonter makes station stops in Springfield, Holyoke, Northampton, and Greenfield. The higher fares are charged when a ticket is purchased for travel less than 14 days in advance and/or when the demand for seats is high on any given train. Discounted fares are available for Children (12 and under), Seniors (65 and­ over), Military (Active), Veterans Advantage, and members of the Rail Passengers Association. If you are looking for a less expensive travel option you should consider taking the Hartford Line from Springfield, and then connect with Metro-North’s New Haven Line service at New Haven Union Station. ¹ The fares listed are for tickets purchased on March 14, 2019 for travel between March 14 – April 12, 2019. Tickets may also be purchased by calling Amtrak on 1-800-USA-RAIL, or by visiting the staffed Amtrak ticket office at Springfield Union Station. Hint! If your travel dates are flexible and you’re looking for a lower ticket price be sure to check out the unofficial website [AmSnag]. The AmSnag website allows you to compare ticket prices between any two points on Amtrak’s network over a range of dates, e.g., you can compare the ticket price for travel from Northampton (station code NHT) to New York City (NYP) for the next 20 days. Amtrak offers a carry-on bike service on the Vermonter that allows you to travel with your bicycle. You may reserve space for your bike by selecting “add bike to trip” when you book train travel on Amtrak.com, by calling 1-800-USA-RAIL, or by visiting a staffed Amtrak ticket office. Bicycles will be stored vertically on a bike rack that has been mounted in selected coaches of the train. Look for the “bike-friendly” sticker on the train car. To see if a particular Amtrak train is running on-time visit Amtrak.com, click “Train Status” and enter the requested information. Portions of the New England Central Railroad’s main line in Vermont are subject to temporary speed restrictions when the outside air temperature is extremely cold or extremely warm. When these restrictions are in place the Vermonter will be delayed. Note that these speed restrictions normally occur only a few times a year, if at all. For those traveling on the Vermonter in the winter — we strongly recommend that passengers boarding in Northampton, Holyoke and Greenfield (on weekends, when the Olver Transit Center is closed) check the status of their train before arriving at the station to limit the amount of time standing out in the cold on the platform.